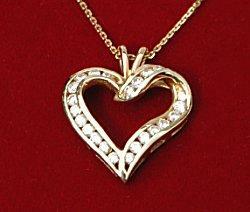 Heart necklaces are classic anniversary gifts. Diamond and gemstone jewelry is the perfect anniversary gift. Not only do such elegant pieces connect to the initial beauty of the engagement ring, but they also connect to the glitter that remains in a couple's relationship for years after they exchange vows. Choosing the best diamond and anniversary jewelry, however, takes more skill than simply picking a pretty item from the case. Anniversary Rings: Specially designed to reflect a couple's ongoing relationship, these rings include designs such as eternity bands and three stone rings that are layered with significance and symbolism. Diamond Earrings: Earrings are a less expensive option than most rings, and with many different styles available - from studs to hoops to dangles - there is a design to suit any fashion preferences. Diamond Tennis Bracelets: The classic, simple beauty of a tennis bracelet is a perfect accompaniment to an attractive engagement ring or other diamond jewelry. Despite the simplicity of the bracelet style, there are actually many options to choose from. Diamond Necklaces: Pendants, chains, charms, and other necklaces are universally popular gifts, with hearts, initials, and other figures available in both elegant and whimsical motifs. Different lengths and carat weights help increase the selection even further. Gemstone Jewelry: For individuals who prefer stones other than diamonds, there is a wide variety of semi-precious jewelry available. Using birthstones to symbolize significant dates, new family members, or other special events is a way to personalize the piece. There is no specific anniversary that requires gemstone or diamond jewelry; an anniversary gift should always be a simple expression of the love and commitment between two people, whether it is their first anniversary or their fiftieth. While some anniversaries are arbitrarily assigned precious gifts such as silver for the twenty-fifth, gold for the fiftieth, and diamond for the sixtieth, the true meaning of a gift is in the sentiment behind it rather than the date it is given on. Diamond jewelry is an appropriate gift not only for anniversaries, but also for birthdays, graduations, or the engagement itself. The best part is knowing the gift is meaningful, regardless of the reason it is given.